Finally, William Nylander has come back to Toronto. The black cloud hovering over the start of the most highly-anticipated Leafs season in decades, and the most long drawn out RFA negotiation of the cap era, is now over after a last-second resolution: William Nylander has come to terms on a six-year contract worth $6.96 million AAV in years 2-6 of the contract. The battles within the battles on a negotiation like this are always fascinating. The Leafs kept Nylander below $7 million AAV in years 2-6, but Nylander got his big year-one salary with bonus money to make him whole for the time missed (that means the Leafs lose out on some year 2-6 savings had they kept the year-one money down). The completed deal locks Nylander up through 2023-24 and buys one UFA season. It is an unexpectedly pleasant result; getting within a few hours of sitting out a season isn’t usually indicative of a long-term pact as the eventual outcome. The consensus at one point was that, if Nylander was going to remain a Leaf, it would likely be a short-term contract serving as a bridge over troubled waters, kicking the big decision on his long-term future in Toronto a few years down the road. 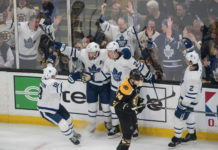 It’s clear now that, despite the non-stop noise that a protracted impasse like this inevitably engenders in a market like Toronto, Nylander never wavered in his ultimate desire to be a Leaf long-term and Kyle Dubas’ view of Nylander as a core piece going forward throughout the Leafs‘ Cup-contention window never changed, either. Dubas and assistant GM Brandon Pridham had to know all along that a bridge deal would’ve put the organization in a precarious spot when Nylander is due up again — this time armed with arbitration rights, with a larger body of work to his name — in a few years; that would have made the Leafs much less likely to hold onto him long-term. An admittedly ugly, protracted negotiation this Fall was a tradeoff to ensure that won’t happen. It was a particularly tricky negotiation for a multitude of reasons. It was Kyle Dubas’ first major contract negotiation with an RFA of note, and beyond the challenging cap realities in Toronto that made it crucial he get this deal right, he had to be aware of the tone it was going to set not only for what kind of GM agents can expect to negotiate with in the future, but how the critical Matthews and Marner negotiations are going to play out. Hopefully, as far as the likelihood of premier young talents taking discounts on their contracts goes, it’s been an educational experience for Dubas as well and he will now move forward accordingly. Discounts, it’s safe to say, are not a cap-management plan. Nylander and his camp were — reportedly — rightfully skeptical about taking a discount as an RFA with no rights to no-movement protections, knowing he’s going to fall in behind Matthews and Marner in the salary hierarchy as of next season. Over the duration of his new deal, that list will likely include Morgan Rielly and Frederik Andersen in ahead of him as well. The result of a hard-fought negotiation is an objectively fair contract. Adjusting the David Pastrnak contract for cap inflation, Nylander comes in just a fraction below where Pastrnak would’ve if he negotiated for the same proportionate value under the current cap ceiling. Comparing their entry-level production, that’s a pretty fair outcome. Nylander has only scratched the surface of what he’s capable of production-wise, and if he pushes into the orbit of a 70-80 point player (where he safely projects, with potentially more to give in his best years) under a rising cap, this deal will be the furthest thing from a problem contract for the Leafs. Even with this contract locked in, it’s difficult to forecast the Leafs cap situation with much clarity without knowing the numbers on Mitch Marner (RFA 2019), Auston Matthews (RFA 2019), and potentially Jake Gardiner (UFA 2019). The focus will shift to the Matthews and Marner negotiation now, with early indications suggesting the Marner camp wants to wait until the summer to really get moving on a deal, while Matthews’ camp may be more open to talks during the year. Nylander will now join the team and get up to speed as best he can in short order and the Leafs will finally be up and running with their full complement of forwards, with Nylander potentially sliding in next to Matthews and Patrick Marleau at even strength once he’s game ready (that was the original plan way back in the summer). Nylander will also take over the second power-play unit consisting of some combination of Marleau, Andreas Johnsson, Jake Gardiner, and Josh Leivo/Tyler Ennis. The question as to how all the missed time impacts Nylander’s start to the season will, of course, be a storyline in the coming days. The best way for Nylander to put this whole thing behind him is to make an impact right away, but missing significant camp as well as significant regular season time and jumping back into game action with the league at full speed is no easy task. The most comparable situation is Ryan O’Reilly’s 20+ game absence in 2012-13; encouragingly, O’Reilly went on to post 20 points in 29 games in the abbreviated season. Nylander’s reputation for his commitment to his fitness and off-ice training is a sterling one — similar to O’Reilly’s — so there is reason to believe he could hit the ground running without too long of an adjustment period. We all know what Nylander is capable of when he gets fully up and running. He’s a high-end play driver who thrives at carrying the puck through three zones and setting his line up in the offensive end, where he’s a brilliant playmaker to go along with a wicked shot release. The duo alongside Matthews is one of the league’s most productive at even strength and should continue to be; last season, they outscored the opposition by a whopping 52-25 at 5v5. They love playing together and Leafs fans will love watching it again. A team with legitimate Cup aspirations — with one of the fastest, most skilled, most offensively gifted forward corps in the league — just got significantly more lethal up front.